If you are looking for information on the Ingredientz franchise business opportunity, Ingredientz franchises or Ingredientz franchising, then you have come to the right place. Ingredientz is Gourmet You Can Do! Life is not getting slower. There will never be more hours in the day. But the needs of our loved ones remain constant. Mealtime has long been a crucial event for families and friends to share important moments together. Unfortunately, even with the best of intentions, our dining habits have digressed to hurried excursions to pick up take out or fast food or to pulling a frozen dinner from the freezer to the groans of significant others and children in the background. INGREDIENTZ helps balance the busy pace of our lives with the need for quality interaction and healthy, flavorful dining options. Led by a world-class gourmet menu that is kept fresh each month, INGREDIENTZ makes gourmet dining easy, affordable, and enjoyable. 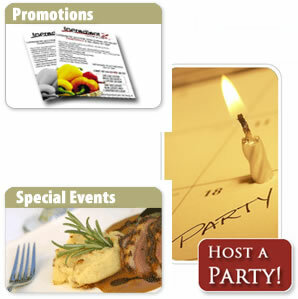 Allow INGREDIENTZ staff's over 20 years of fine culinary experience make you a hit in your community. They'll love you for it! An innovative and extremely flavorful menu is published each month. Customers call or utilize INGREDIENTZ's extremely user-friendly online ordering system to make an appointment and select the meal items they would like to assemble. The customer enters their local INGREDIENTZ location at the appointed time and is greeted by a warm and friendly environment and service host. All food items are already chopped, diced, and sliced beforehand so the customer simply follows the prep guides to create the foundation for gourmet meals their family and friends will love! FOOD, FOOD, and SERVICE. The INGREDIENTZ menu is second to none. Gourmet dining is delivered to customer's fingertips with each entrée, creating deeply satisfied patrons and unparalleled loyalty. INGREDIENTZ also believes strongly that food is a means to enhancing relationships. FOOD is a conduit for social interactions. INGREDIENTZ loves contributing to simplifying the delivery of better, more flavorful and healthier, dining experiences to families and friends at an extremely competitive price. Perhaps the INGREDIENTZ service mission says it all: Deliver better food than people would have gotten anywhere else at an extremely competitive price to help clients focus on fostering great relationships in their lives. GREAT food, service, and an offering that contributes to better relationships is why INGREDIENTZ can boldly say - They'll love you for it! INGREDIENTZ has developed exceptional training models, purchasing programs, and support materials to greatly assist FRANCHISE OPERATORS. What is more, the INGREDIENTZ staff LOVES what they do and is extremely passionate about making GOURMET accessible to Main Streets across America - and beyond. This pushes the Company to constantly innovate, develop, and streamline the offering to allow FRANCHISE OPERATORS to focus on what they do best: Developing and maintaining extremely satisfying customer relationships. People choose dining options with three primary things in mind: Time, Money, and Food Satisfaction. The INGREDIENTZ model solves the incredibly pressing need of people not having enough time in the day to prepare appropriate meals for their families and friends. INGREDIENTZ saves customers time without greatly impacting the budget they already set aside for groceries. And the INGREDIENTZ menu has a distinct fine dining and freshness flair to it that sets it apart from any other alternative. Saving TIME, delivering exceptional SATISFACTION, and doing so at an accessible PRICE is the INGREDIENTZ way.